Parents for Public Schools of San Francisco staff wants to learn from San Francisco parents and family members as we plan for the organization's future. 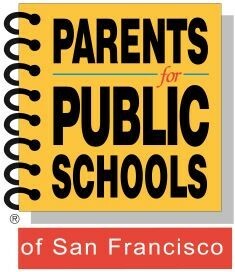 The facilitated discussion, led by local firm, Collective Invention, will focus on your experience as parents of students in SFUSD and will help us better understand how to support families, and to build a vision for the future. RSVP to Miranda Martin: miranda@ppssf.org or call 415 861-7077 if you are interested in participating. Note: This group is limited to 8 participants. Participants will be selected to represent a mix of ages, neighborhoods, ethnicities, backgrounds, and ages of your students. We may therefore not be able to include everyone who is interested. If you are open to being contacted again for a group in the future, we may want to keep your contact details on file.